If I were to ask the average urban or suburban American with no agricultural experience to describe their idea of a farm in the Midwest, he or she probably would envision a vast monocrop stretching unbroken for hundreds or thousands of acres. On Jimmy Emmons’ farm in Dewey County, Oklahoma, this could not be further from the truth. 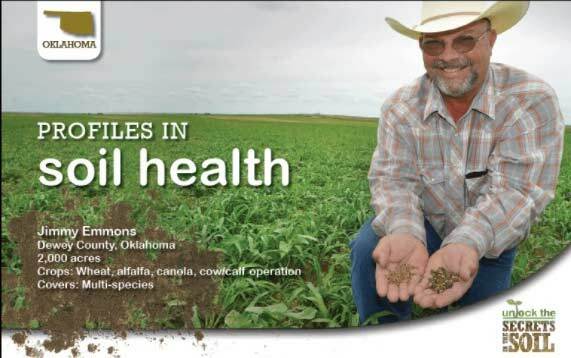 As president of the Oklahoma Association of Conservation Districts and board chairman of the Dewey County Conservation District, Emmons is leading by example in an effort to improve soil health on his farm and throughout the state. His foray into conservation practices began when he was introduced to no-till, a method of farming that removes the practice of tilling or plowing the soil in preparation for replanting, in favor of using a no-till planter that creates a narrow furrow just large enough for seed to be placed. According to the Natural Resources Conservation Service (NRCS), “no-till farming increases the amount of water that infiltrates into the soil, organic matter retention and cycling of nutrients.” Used in conjunction with cover crops – crops planted on the field in between cash crop rotations so that there is always organic matter growing in the soils – as done on Emmons’ farm, no-till results in healthier and more productive soils. Currently, he is growing sunflowers, grain sorghum, and cow peas for seed, with other crops such as soy beans, winter wheat and canola in rotation. In between cash crop rotations, Emmons plants about a dozen species of cover crops. But he doesn’t just grow crops, Emmons’ farm is a combination of approximately 2,000 acres of production cropland and a cow-calf ranching operation on about 6,000 acres of grassland, which have a symbiotic relationship under his land management plan. For most of the year, the cattle are rotationally grazed on the aforementioned 6,000 acres of grassland, but every summer Emmons moves them for summer grazing on his cover crop fields. This practice takes pressure off the grassland and gives it time to rejuvenate, while the cattle provide some natural disturbance to the cropland in preparation for the planting of the fall cash crop rotation. Implementing all of these practices requires a lot of knowledge and hard work that would be almost impossible for a farmer to achieve on his or her own. “Our local office in Dewey County and our local NRCS have played a critical role in helping us implement all of these practices on our land,” says Emmons. Additionally, Emmons has worked closely with the Noble Research Institute, which helps farmers and ranchers research and implement agricultural practices that improve land stewardship and productivity, to test new conservation practices on his land. In his role as President of the Oklahoma Association of Conservation Districts, Emmons is working to expand these practices across the state through meetings with all 86 conservation districts in Oklahoma, and holding field days on demonstration farms in association with the NRCS. Emmons estimates they’ve done about 20 field days this summer alone, the focus of which has evolved over the years, he explains. The general focus is always soil health, but the first year they focused on cover crop plant identification, why a diverse mix of species is important, and the purpose of each species in that mix. This summer they went deeper, digging soil pits in order to study the root structures, soil biology and water infiltration. Next year, the field days will literally be going microscopic to get a detailed look at all of the microbes in the soil that make up this fragile sub-surface ecosystem, with the goal of understanding how farming practices can harm or heal them. According to the USDA’s 2012 Census of Agriculture, no-till farming is becoming quite popular across the country, with approximately 18 percent of farms and almost 25 percent of total cropland acres utilizing no-till practices. At 11.5 and 21 percent, respectively, Oklahoma lagged a little behind the national average in the 2012 census. Unfortunately, the use of cover crops was much lower – around two to three percent nationally and in Oklahoma. However, Emmons will be the first to say that those numbers have improved since. After all, his intense outreach efforts began after the census was published, and he reckons they’ve touched about 10,000 different people in Oklahoma in the past year and a half alone.